RPS-150 Self Contained Ultrasonic Sensor - Deeter Electronics Ltd. RPS-150 Self Contained Ultrasonic Sensor - Deeter Electronics Ltd. The RPS-150 family of self-contained, wide beam angle, ultrasonic sensors can be used as proximity sensors or level sensors. The advantage of this sensor is that the target does not have to be at right angles with the sensor in order to be detected. A flat target can tilt up to 35 degrees and still be detected. For set-up purposes an LED indicator is provided. When in the non-detect state the LED is Green and when in the detect state the LED is Red. The RPS-150 can be operated in two modes: a proximity and a hysteresis mode, described to the right. The frequency of operation is 38.5kHz. There are two ranges available in this model: 2″ to 40″ or 5″ to 80″. 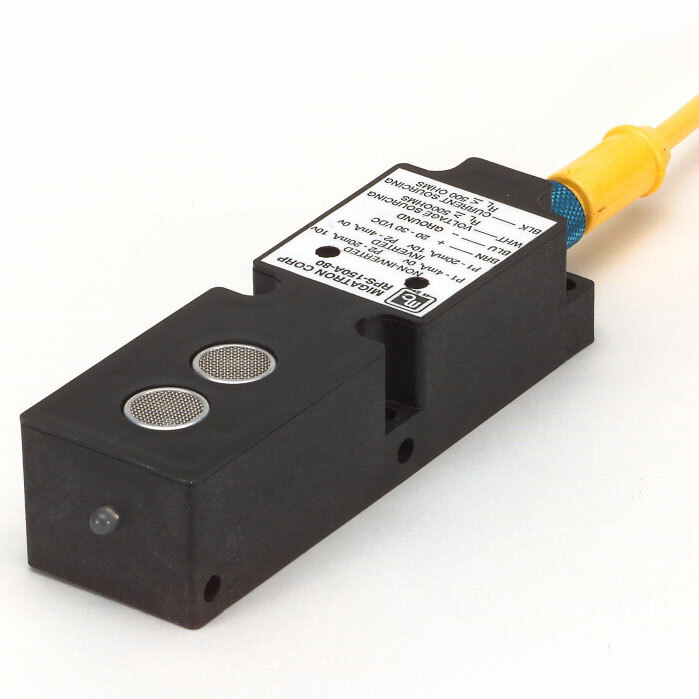 The sensor is available with a 120VAC power input or a 20 – 30VDC input.It also features a quick disconnect receptacle. The housing is constructed of plastic valox and has standard 30mm X 60mm limit switch mounting dimensions, as well as side holes for mounting the sensor on its side. The output consists of two solid state relays N.O. N.C., and can switch 2 – 130VAC or VDC up to 100mA DC or 50mA AC continuous. The relay outputs are short circuit protected and isolated up to 1500 volts rms. Proximity detection is the detection of an object at a given distance. The detection range of the RPS-150 is controlled by the “Range Control” potentiometer. Any object within the desired range is detected, while objects out of range are ignored. The range of the RPS-150 is either 2″ to 40″ or 5″ to 80″. This means that in the proximity mode the object will be detected from whatever detect point is set to the minimum sensing range of the sensor, either 2″ or 5″. The hysteresis control potentiometer needs to be off by turning the pot counterclockwise. The RPS-150 is furnished with Hysteresis Control by means of a second potentiometer. This control allows you to adjust the turn-off point while the range control adjusts the turn-on point. (Example: Range pot set for 10″, Hysteresis pot set for 20″. With these settings the sensor will come on when the target reaches 10″ and stays on as the target moves away to 20″.) This Hysteresis can be adjusted to start from the detect point over a range of .5″ to 40″ with the 40″ sensor and 1″ to 80″ with the 80″ sensor. 2 Solid State Relays N.O. N.C.
whichever is greater at 70 degrees F.
This is a description of how the RPS-150 or the RPS-401 can be used as a two point level control. A. When the pump control relay is connected to the normally closed output of the sensor and the container is empty the pump will start up when power is applied. The container will fill until the liquid level rises to the range potentiometer setting. B. This is the highest level. At this time the sensor output will change state and the pump will shut off. The output will latch in that state until the liquid level descends to the point where the hysteresis potentiometer is set. C. This is the lowest level. At this point the sensor will change state, turning on the pump and latch until the level rises to the range potentiometer setting again. Then the process repeats. Wire the pump relay to the normally open contact. This will reverse the process.